A Year of Being Here: Adelaide Crapsey: "November Night"
"November Night," by Adelaide Crapsey, from The Complete Poems and Collected Letters of Adelaide Crapsey. Edited by Susan Sutton Smith. © State University of New York Press, 1977. 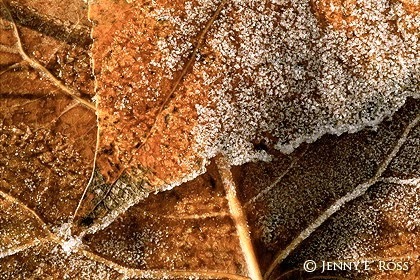 Photography credit: "Melting Frost on Cottonwood Leaves," by Jenny E. Ross (originally color).